One of the things I like about the desert is that you find a lot of things here that would not happen in big cities. The ample amount of cheap land allows the artist especially unique opportunities to create art in the stark contrast of the surrounding desert. 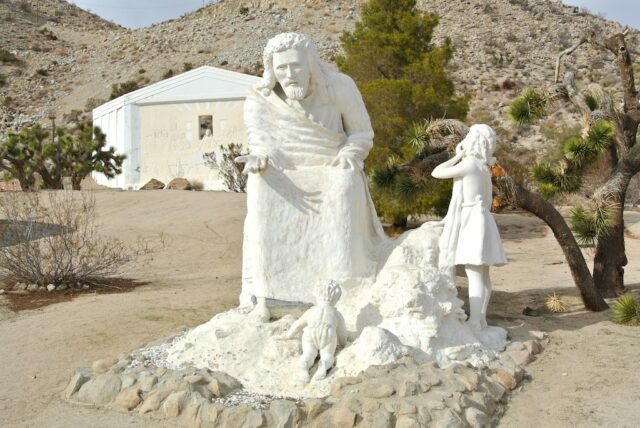 A perfect example of this is the 3.5 acres overlooking Yucca Valley that are the canvas for Desert Christ Park, which can be summed up as 40 sculptures of Jesus ministry culminating in a massive last supper sculpture that you can put yourself in. 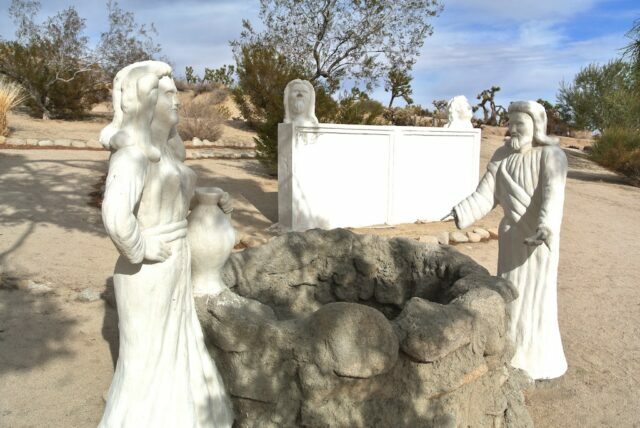 The Desert Christ park is a very interesting thing to visit. 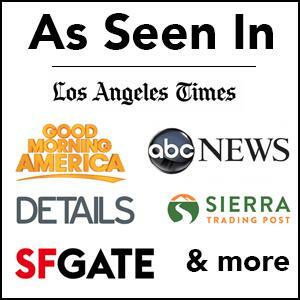 Here is the history from their site. 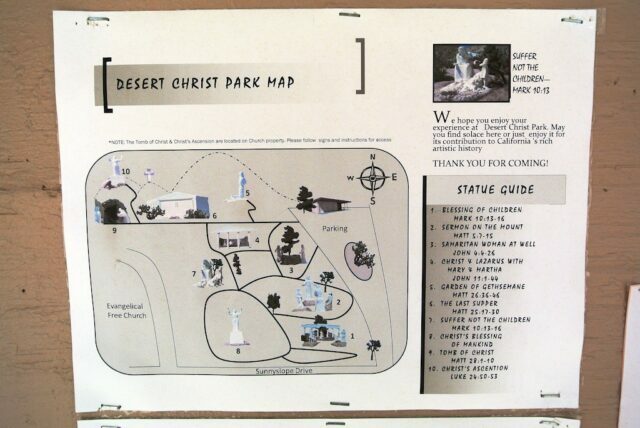 Desert Christ Park was established in 1951 on the original five acres where the Evangelical Free Church now resides. 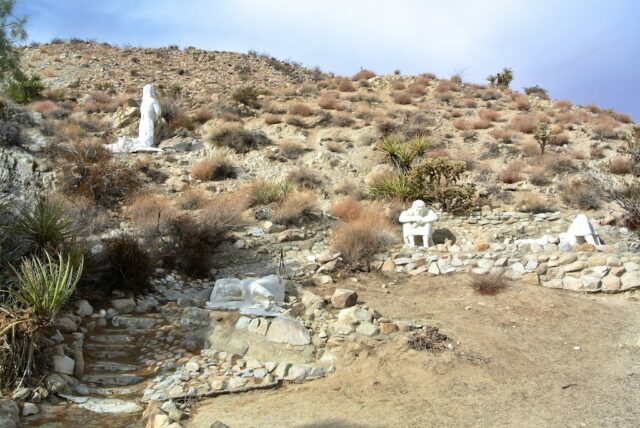 The property at the time was owned by the Reverend Eddie Garver, a humble preacher who made his way to Yucca Valley with his wife and two children in 1946. 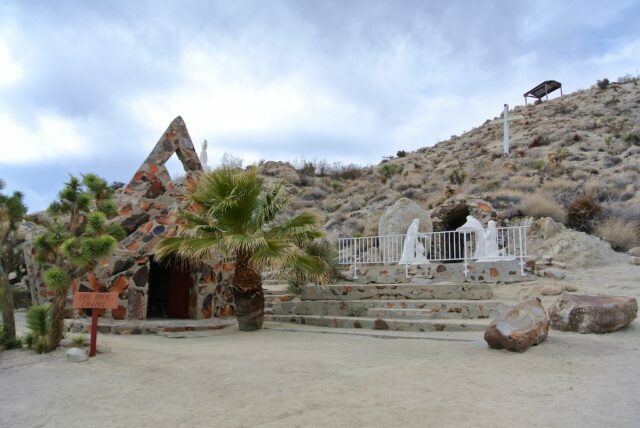 He established the Yucca Valley Community Church, then located at Santa Fe and Apache Trail, and acquired the five acres on the southern facing slope of the valley from the US Government in 1950. 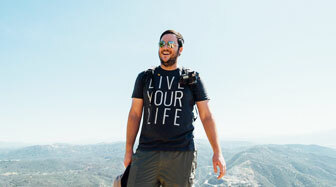 Known as the Desert Parson, his vision was to establish a christian-themed park as a light for world peace. Through a series of events, Eddie Garver was introduced to Frank Antone Martin, a sculptor-poet from Inglewood, CA. 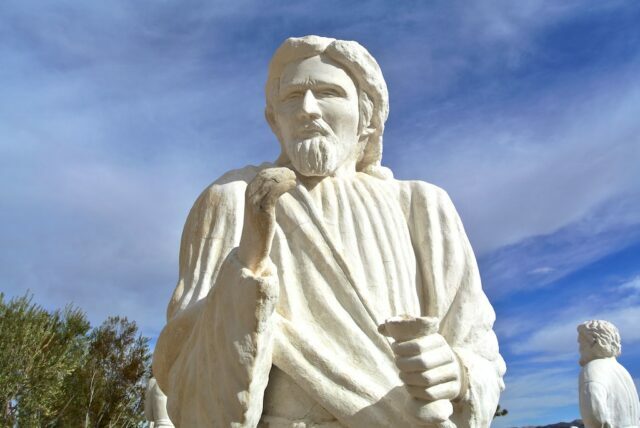 An engineer by trade, who came up with the idea to create statues out of steel-reinforced concrete, Martin’s dream was to place his 10 foot, 5-ton ‘resurrected Christ’ on the rim of the Grand Canyon as a symbol of peace to all mankind. 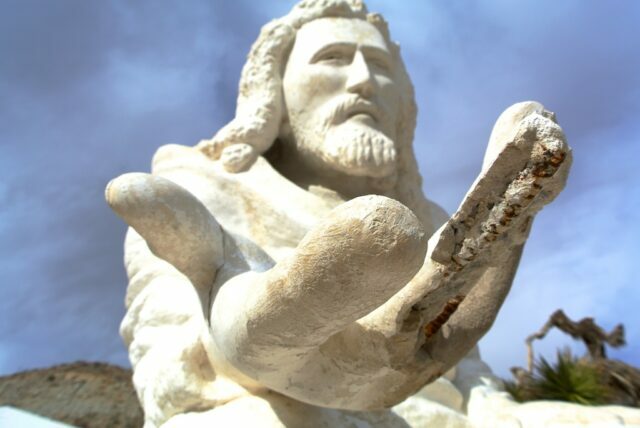 When separation of church and state issues denied his request, he labeled the statue as “the unwanted Christ” and spoke to several organizations before settling on Eddie Garver’s offer to place it on a hill where all could see. 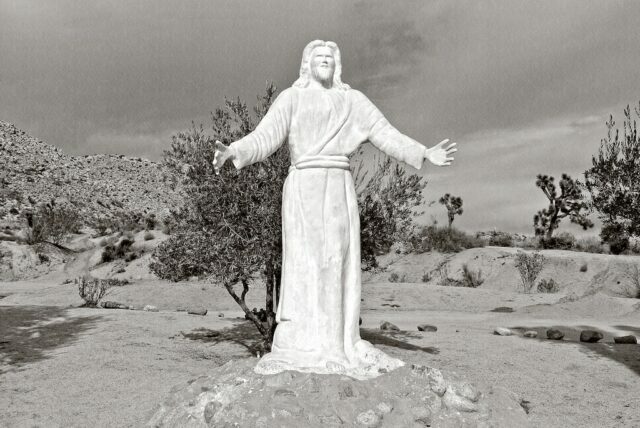 One week before Easter 1951, the “unwanted Christ” was brought up the desert highway from Los Angeles on the back of a truck. This event sparked national interest and was covered start to finish by Life Magazine for their April 23, 1951 issue. 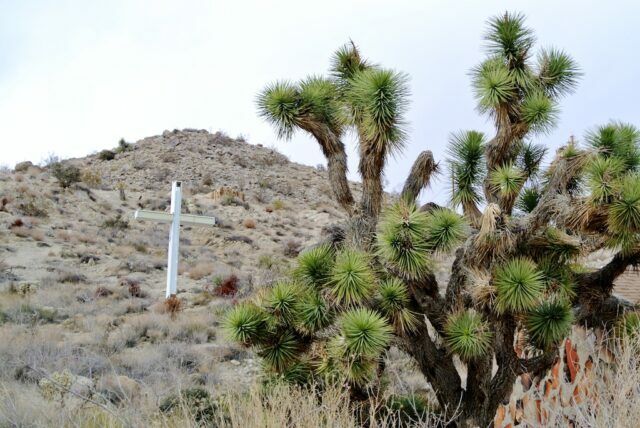 Desert Christ Park was dedicated on Easter Sunday and celebrated by the community it embraced. When I arrived on a quiet Saturday afternoon I was the only person there checking out the park. The Yelp address was not correct so I got a little switched around when I visited but after finding it I was able to park in the upper church parking lot that is adjacent to the park and start to explore. The first thing you come upon from this direction is the unique Rock Church with its 8 small pews that you can explore and right outside of it is the first sculpture which is the empty tomb of Jesus. Here is a map of the property for an example of what you can see and what scripture they relate to. Some of these sculptures have been vandalized though with missing limbs and such but about half are still in good condition. Like seeing graffiti on the trail it is always sad to see people not respecting someone else’s art by vandalizing it, but that is a discussion for another post. Here are some of my favorite pictures from the park. The crowning achievement from this park is their large last supper stand up sculpture. This sculpture is more of a wall but it is unique in that it has a cut out right near Jesus where you can pose for a picture with your arm around him. An interesting but fun addition to the sculpture. 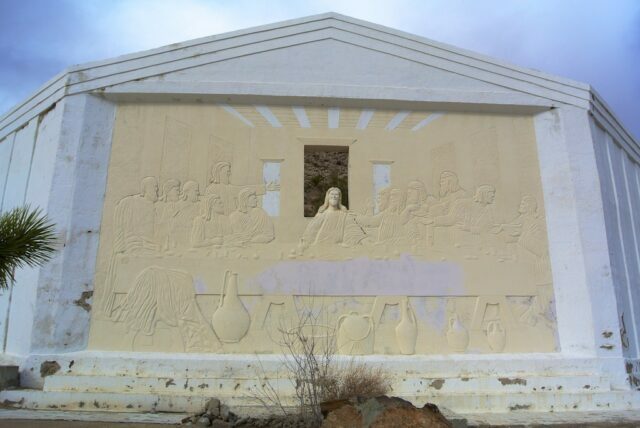 I felt the last supper was a little hard to see since all of the people were just carved into the wall in the same color as the overall piece but it was still very unique and interesting. All in all I enjoyed this park. I love weird things and the fact that they have created and maintained these sculptures in the harsh desert for over 60 years truly is amazing. Plus, as a Christian myself it is fun to see different depictions of the Jesus story especially in large cement sculptures. 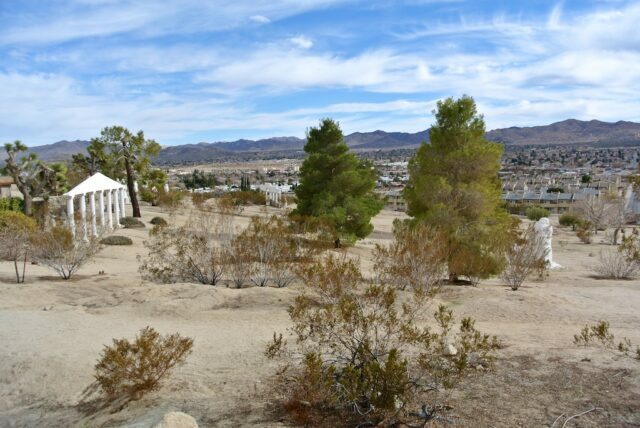 If you are going I would suggest adding something else onto the trip like a drive up to Pioneertown for a meal at Pappy and Harriets or even a visit to Joshua Tree. Get directions for yourself below and make sure to leave me a comment.